I’m new to this new adventure and really could use some help/ advice. I bought a hermit crab from petsmart and they told me to only use the coconut fiber substrate because sand was really bad for them. So I got that. I bought the heater that goes on the side and a couple of new shells. I have a 25 gallon octagon shape tank. There’s two dishes in there for salt water and reg (dechlorinated) water. I have a “hut” and some fake vines. As soon as I put him in there he immediately dug down and I haven’t seen him since. So I started reading again. Alright, he needs friends. So I bought 2 more yesterday. After reading a lot, I bathed these 2 guys and added them to the tank. One took off exploring and then buried himself. The other went in the “hut” and I’m assuming buried also. They have food. Which is the food medley that has pellets, dried shrimp and meal worms. Yesterday I had put in fresh raspberries and carrots that were chopped up. There’s no sign of anything being eaten. I change out the food and add water daily but... I’m lost. I now think I need to add sand. I have about 3 inches of the coconut fiber and they are all buried completely. They’re all about the size of a half dollar or so. Should I bring them out and add sand?? The temp is steady between 75-76. I do not have a humidity gauge yet but I’ve been misting and have a bubble maker in the water. I’m sorry! I am new to this forum also. I see now that there are specific places for me to post these things but I don’t know how or if I’m allowed to move my post! Hermit crabs are nocturnal. For the first week or so, you may not see them. Keep replacing the food, as they will come up at night and eat very small amounts. You most likely won't see them eat either. They do, however, come out in the day to climb and explore. Hermit crabs also react positively to higher temperatures between 76 and 82. To accomplish this, you should get a (UVB/UVA) heating lamp. What kind of cover do you have on the crabitat? As for the substrate, three inches is too low. You want to keep it at about six to give them good space to dig, but you also need to give them some to climb. Since you've already put the hermies in, you should never dig them out. play sand is definitely safe for the crabs. The store worker was probably referring to calci-sand, which is for eating. Eco-Earth is fine, but very tough to take care of. It doesn't hold moisture well, and if you moisten it too much it rots. What people on this forum use is generally a 5-1 ratio of playsand from home depot or pet stores and eco earth. Since you have your crabs in, you shouldn't replace the sand while they're under, but you can add more eco earth (EE) about one inch high at a time, every 24 hours. Adding too much on at once will suffocate them under the substrate. 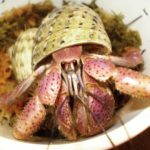 If you want to replace your substrate, you should make an iso tank, which is for isolating your crabs if something happens, or rare occasions. Read all about those here on the HCA. You'd have to take your crabs out of the tank when they're surfaced. All things aside- Welcome to the site, and DEFINITELY check out the care pages. They'll tell you all you have to know; mostly stuff you can't find anywhere else. Good luck with your reading! Hi. Welcome! As Landfishh said, you can add 1" of substrate every 24hrs. Just don't pat it down. You should add play sand since you already have the ee in there. The crabs will mix it up. First mix the sand with dechlorinated fresh water to sandcastle consistancy. If you squeeze it and it drips, it's too wet. Add more sand. Keep reading the care guides. I'm not sure I'd recommend messing with anything just yet. They'll certainly need more once their molting cycles swing around and some are active while others are molting, but right now with all of them being down together, they should be safe. The depth is mostly to keep them secure from others, and it sounds like they have enough to get well covered at the moment. Sand is heavy and coco fiber will compact underneath it, possibly too much. Sadly it is normal for new crabs to come home and bury. That's how I ended up in trouble, I kept bringing home more and they all would disappear that first day. They just need time to molt and then you'll have an active tank. They go through a lot before they get to our homes, this is their way of healing. And don't worry about posting in the wrong place! We catch stuff and move it to where it best belongs. It's why one of our members (motörcrab) suggested we make this area, so when anyone new comes with questions we can find it and give a quick answer. I just worried so much and since I had only had two of them for a day and the other not many days prior to that I bought some clean all purpose sand at Lowe’s. Lastnight before going to bed I checked in on them and one was eating!! This morning that one just seemed to get sleepy right beside the food dish. So I went ahead and mixed the sand with the coconut fiber and added the declorinated water to make a nice consistency. I took all 3 of them out and fixed their home up. They are actually all playing and climbing and one even took a bath. I am so very happy now! Thanks again and I will definitely keep reading on here to learn more about these amazing little guys!